The distiller makes 1 gallon in 5.5 hours and makes up to 4 gallons a day. 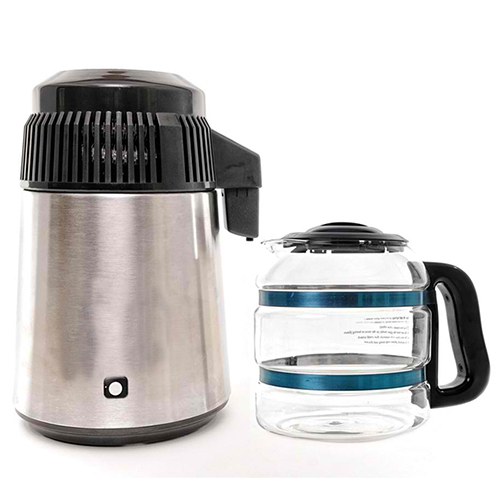 It features a full stainless steel boil chamber, dome, condensing coils, and glass collection for the purest distilled water. Simply add water, press the start button and let the distiller do its work. It will automatically shut-off after completing the distillation process. Research the internet. Distill the Radiation out of your water. By Anthony Zaca of Rainier Distillers, Yelm, WASHINGTON. Distilling removes radioactive Iodine, heavy metal, salts and microbes from water. This is the definition of what distilling does. For the past few days I have been disturbed by what has happened inJapan. Very upset about the meltdowns in nuclear reactors. As you know, the West Coast of America is in the jetstream. Authorities have been caught trying to cover it up and lessen the damage. What this means is that there is radioactive fallout carried by the winds and rain over to our west coast. I have been very busy getting the word out, about how we can clean our own water, even if contaminated. I am just going to get into some of the basics here. Yes, distilling removes radiation. Even a water distiller you see all over ebay fromChinawill do this. Your cost will be around $130-$200 dollars. There have been many lab tests in the country where they contaminate the water 5 times higher than what EPA allows for consumption. They test this and distill water, retest and they find the residue that is left behind contains all the heavy metals, which are classed as radioactive. Most of the heavy metals have a boiling point of 3092 degrees F, meaning the metals actually boil at that point. The boiling point of water is 212 F which is 2800 F below that. Heavy Metals are left behind as waste in the pot. Radiation is in the same family in the periodic chart as these heavy metals. Does this mean you can take contaminated water and make it clean? Yes. The process is called thermo distillation which is heat. This can be very expensive to do for everyone’s supply but just for your own, this is very easy. If you get an electric one, around $200, it distills a gallon of water overnight. There are distillers that can run on propane gas as well and wood fires for those who live OFF THE GRID.